Big Blue is a race track of the F-Zero Grand Prix set on an ocean-covered planet that appears as an unlockable stage in Super Smash Bros. Melee and Super Smash Bros. Brawl, and as a default stage in Super Smash Bros. Ultimate. In Super Smash Bros. Melee, the stage is unlocked by playing 150 total Vs Matches. In Super Smash Bros. Brawl, the stage is unlocked by playing 10 Vs Matches as Captain Falcon. 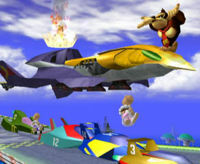 The stage is side-scrolling at a high-speed and the fight takes place on top of several F-Zero Racers, as well as Captain Falcon's personal spacecraft, the Falcon Flyer. Players can use the race cars as platforms, as well as several other platforms that appear frequently throughout the stage. Players who stand on the race track itself will be carried to the left and will be knocked out if they don't jump off in time. In Super Smash Bros. Melee, a soundtrack based on Mach Rider's theme can be played as an alternate track. In Super Smash Bros. Brawl, the track was moved to the new Port Town Aero Dive stage, and is replaced with Super Smash Bros. Melee's rendition of Mute City's theme. In Super Smash Bros. Brawl, Wario (during his Final Smash form, Wario-Man) can keep up with the F-Zero Racers for a small period of time on the Wario Bike. Sonic can do this as well, while he is wearing a Bunny Hood. Big Blue is the only unlockable stage from Super Smash Bros. Melee to appear in Super Smash Bros. Brawl. This page was last edited on April 25, 2019, at 15:06.